County Limerick surnames. Is your Irish surname here? 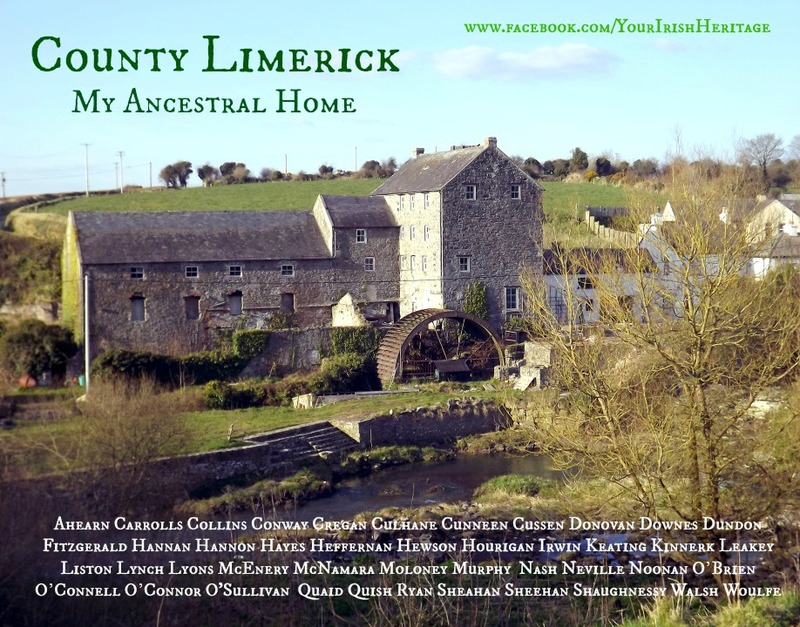 The surnames of County Limerick – Ahearn, Carrolls, Collins, Conway, Cregan, Culhane, Cunneen, Cussen, Donovan, Downes, Dundon, Fitzgerald, Hannan, Hannon, Hayes, Heffernan, Hewson, Hourigan, Irwin, Keating, Kinnerk, Leakey, Liston, Lynch, Lyons, McEnery, McNamara, Moloney, Murphy, Nash, Neville, Noonan, O’Brien, O’Connell, O’Connor, O’Sullivan, Quaid, Quish, Ryan, Sheahan, Shaughnessy, Walsh and Woulfe. and a picture of the beautiful watermill at Bruree (Brú na Rí) – the old royal seat of the Uí Fidgente tribe. Hi I understand that my surname comes from Co Limerick but I don’t see it there.I don’t think I am conected to the Gunnings from there as all my ancestors came from Co Down so they would probably been part of the Plantations as they were Protestant. Are you planning on doing Ulster soon as I have other names from there. By the way put in your name on Facebook but can’t find you! Mandy – see the menu on the right side that says “search by your surname”. Choose the surname Gunning. I have added an explanation in one of the posts. You can add your own story there or ask further questions. All the best, Mike. Toni – that name would normally be found in County Tyrone I do believe – and a seperate group in County Meath. What/where is the origin of the name Collins? Yep – Collins is from the Irish Ó Coileáin – a family that originated in Limerick as part of the Uí Fidgenti sept – but mostly moved to southwest Cork a thousand years ago! I’ve found my great-grandmother’s name on this list : Cregan! My Cunningham family have lived in County Limerick as far back as the 18th century (that’s as far as the records go) until today. Yet I never see them in the list of Limerick names. I know that the name had two origins: one from Ulster and the other from Niall of the Nine Hostages. My grandparents were from Clare and Tipperary. Last names Neville and Sheehan. Any updates/news would be appreciated! Thank- you! Hi thHello there I have been receiving you weekly letters and find them very int interesting. The name IRWIN is on the list for County Limerick but I have had no luck in finding my gr gr grandfather so far. Where do I look for John Irwin father of Thomas Irwin born in Cavan 24 May 1864 who went to Canada/ USA about 1888 His mother was Ann ? Any help would be very much appreciated.